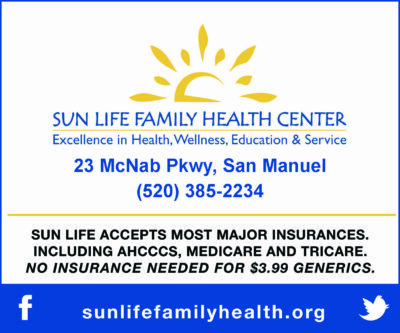 Mammoth – San Manuel School District and the Arizona Early Intervention Program (AzEIP) will provide a free child development screening to any child living in the community who is under the age of 5. The school district and AzEIP are very committed to early childhood developmental interventions because research has shown that from birth to age 5 is a very critical period of learning for children. Early identification of delays in development and early educational interventions has been shown to have long lasting impact for improving the lives of children. An Early Intervention Specialists from AzEIP will provide the screenings on any child who is between the ages of Birth and 3-years-old. AzEIP is a statewide system of supports and services for families with children who are between birth and 3-years-old. The school district’s Early Child Development Team will conduct the screenings for the children between the ages of 3-years and 5-years-old. The Early Child Development Team is made up of preschool teachers, speech pathologists, and school psychologist. All children taking part in the developmental screening will be observed for the following developmental skills: hearing and vision; muscle coordination; speech and language skills; cognitive development; social skills and self-help skills. The results of the screening will be shared with the parents and suggestions and recommendations for each child screened will be offered to the parents before they leave. The Early Child Development Screening will be on Wednesday, Feb. 20, 2019 at the San Manuel High School Auditorium. The screenings will begin at 9 a.m. and end at 1:30 p.m. The Child Development screening is purely voluntary. Interested parents should call Katie Smith at First Avenue Elementary School 520-385-4341to schedule a time for their child to be screened. Walk in appointments during the screening are also welcome. Parents who are concerned about their children who are five years and older should contact the Adaptive Education Office to schedule an evaluation (520) 385-2337 ext. 1105.